Four years ago, I offered my first assessment of the shop system status quo and two years ago came the update that Shopware had undoubtedly proven itself as the clear winner in the SME segment. The German version of the update,“Das beste Shopsystem 2014 — Anspruch und Wirklichkeit” (The Best Shop System of 2014 — Aspirations and Reality) was visited well over 100,000 times and now, after a further two years have passed, it’s time for the update itself to be updated! Back then in 2014, I wasn’t personally active in the shop system market and my focus was on systems for small and mid-sized enterprises. In the meantime, I’ve gained almost two years of experience as the founder of Spryker and am now able to transfer the central questions to the market for enterprise customers. But, before I get started, let’s just take another brief look back at the findings from the older article and check whether the statements are still valid. 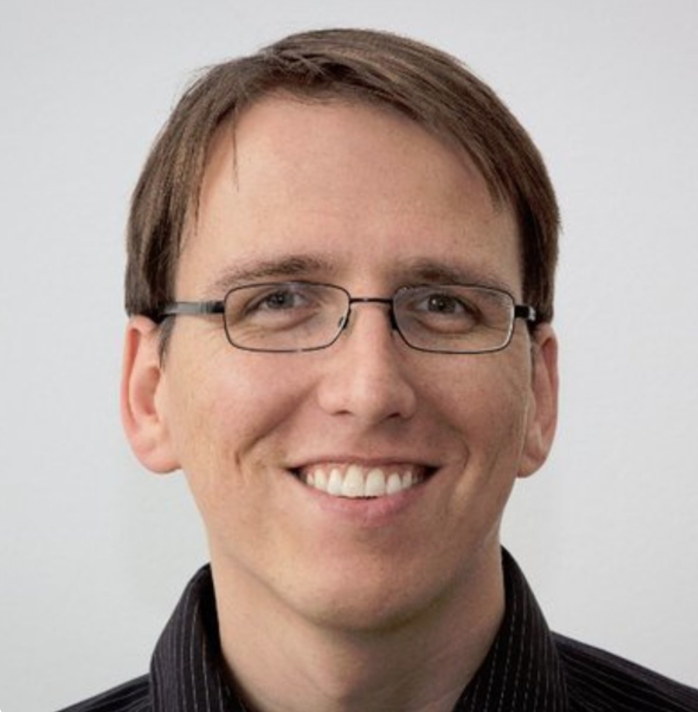 Is Shopware still the best shop system for the professional class in Germany? In the 2014 article, I tried to divide the producer market into four categories. A lot of SaaS providers such as 1&1 shops, tictail and Shopify clutter up the smallest category. The second category, “Professional Class”, is dominated by Magento, Shopware, Presta and the like, whereas companies such as Hybris, ATG and Intershop are situated in the “Enterprise” section. The fourth (and most demanding) category addresses pure-play systems. To date, these are almost always in-house developments, which differ significantly from the standard scope of enterprise systems, in order to build highly customized models such as Otto.de and Zalando. In my opinion, this division still applies, and we at Spryker have placed ourselves in the fourth category as a solution. More on that later. In general, all of the categories serve very different use cases, although the largest providers in the Enterprise Class came into being with the first e-commerce boom (1998–2002) and were and are often used for problems stemming from this time. This post by Fortrabbit is useful for anyone looking for an almost complete overview of the new developments in the shop system scene. In the Professional category for the 2014 article, I assumed that Google Trends would be a good indicator to find out which system had the highest momentum due to its high installation base. This momentum is accompanied by many positive effects and new projects would do well to set to it. 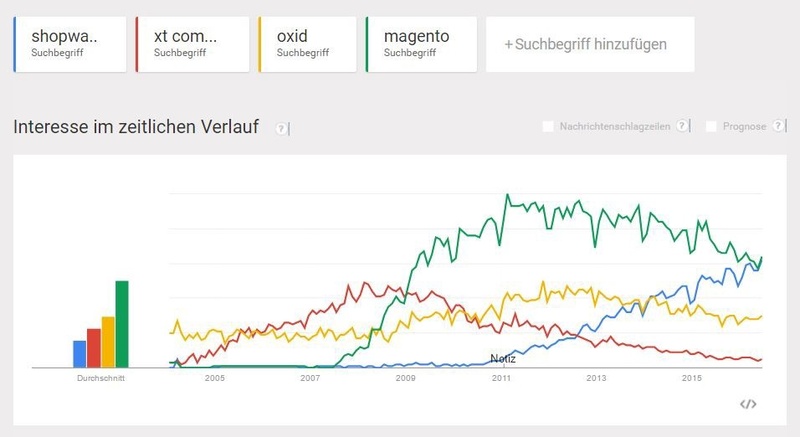 Back then, Shopware already had the highest momentum and nowadays the company is just about to overtake Magento in Germany. This is extremely impressive when you consider the fact that, in comparison to Magento, Shopware 2010 was just a niche provider. Two years ago, it was still anticipated that the long awaited Magento update (Magento 2) would put the wind back in this platform’s sails. The result, which went live a few weeks ago, is a disappointment. It’s years overdue, partly uses old PHP frameworks (Zend Framework 1), still applies long-outdated concepts such as EAV and full-page caching and the code is still extremely muddled in many places. I have discussed this with many Magento agencies and nobody is really impressed. Furthermore, I think it is inconceivable that Magento 2 is even slower than Magento 1. "When compared to Magento 1, Magento 2 performed slower for the same load test scenario and data sets. The results clearly indicate that Magento 2 must run on a more powerful server in order to operate properly or at the same level as Magento 1. Even when a proper server is selected, Magento 2 performance is still lagging behind when compared to Magento 1." This is such a shame when you consider that the current ownership structure will not lead to improvement in the future. Existing customers and partners will just be milked like dairy cows instead. This is, in turn, great for Shopware, who can clearly emerge victorious in this development in Germany. Another exciting aspect for Shopware and all other providers in this segment is the fact that producer support for Magento 1 is due to expire by the end of 2018. Many customers and agencies that I know in this environment will no longer upgrade to this system due to Magento 2’s disappointing architecture. In addition, relaunching based on a one-time installation is often not enforceable for many of the larger customers because longer support periods are expected. What really makes this area exciting is that problems and challenges stemming from the customer have changed. For the most part, problems no longer simply revolve around “just” an online shop and newer providers such as CommerceTools, offer welcome alternatives provide completely new technical approaches. The delicate balancing act which has to be performed for these providers and agencies concerns extremely different customers such as Katrin at Vintageliebe.de on the one hand, who uses Shopware as a self-service alternative to Shopify, and, on the other hand, Enterprise customers, who have €1,000,000 requirements but are only prepared to pay a max. of €250,000 per project. What is different in the enterprise market? "What’s the biggest technology mistake you ever made — either at work or in your own life? When I was at IBM, I started a product called Websphere [which helps companies to operate and integrate business applications across multiple computing platforms]. Because I had come from working on big mission-critical systems, I thought it needs to be scalable, reliable, have a single point of control … I tried to build something like a mainframe, a system that was capable of doing anything, that would be able to do what might be needed in five years. I call it the endgame fallacy. It was too complex for people to master. I overdesigned it." Nowadays, this “endgame fallacy” refers to the majority of companies which compulsively try to rebuild their legacy IT structure in order to successfully create digital projects. But this just cannot be resolved due to market conditions. Nobody can know what will still be relevant in 3 years and what is considered a USP today is most probably the norm in 12 months. I discussed some of my thoughts on the issue in the article “Die zweite Hälfte des Schachbretts” (The other half of the chessboard). A fatal environment for typical IT departments. Customers should really reflect on which technical generation they wish to establish for their own e-commerce business. If it is merely a feature of the company, following ERP rules (1st and 2nd generation), this has a considerable influence on the choice of system. If it should reach the level of today’s pure-players such as Zalando, the ERP it is completely stripped of power and the shop platform becomes the base of the IT infrastructure. It forms a kind of connector in the ecosystem, towards OMS, apps, CMS, PIM, BI, CRM and so on. This creates the dilemma that existing systems and business models have no upgrade path to the “new” e-commerce world. This is stupid but unfortunately cannot be helped. Existing systems can possibly still be upgraded and modernized to a certain extent. Technically, new business models almost always have to be completely redeveloped and should, as far as possible, refrain from being like the old systems. Such problems have recently been occurring in Enterprise projects. Many agencies and producers are currently having to pay for this dilemma as they have to connect to the 2nd and 3rd e-commerce generation for many RFI processes. Which systems play a role? Many. Very many in fact! When it comes to the 2nd generation systems, Hybris is doing a really good job at the moment. The same applies to Demandware who has an excellent pitch and is creating a sensation, particularly in the USA. As for the 3rd generation systems, Oro Commerce(the former Magento Team) is trying to position itself in the B2B environment and we are currently involved in many selection processes with Spryker, when it comes to building new business models, “digitalizing” company structures or simply creating a new technical base for larger pure-players. But at this point, there’s no better or worse or right or wrong. We are addressing many different scenarios that companies should be aware of. 1st and 2nd generation e-commerce technologies distinguish themselves by their initial IT which is usually a cost center and not a business model driver. Moreover, these models do not grant the right to own this technology and to completely customize it at will. It is merely adapted and presumes that the producer is kind enough to allow for downward compatibility so that participating in new developments cost-effectively is a possibility. This hardly ever works, but it is nevertheless attempted time and time again. The current generation’s e-commerce models (Zalando, aboutyou, fahrrad.de, Limango etc.) are generally technology-driven companies. They consider technology to be at the core of their value creation and IT departments are not organized as cost centers. You only have to take a look at the leading e-commerce companies. They invest very heavily in their IT, so that, on the business side, they never have to wait very long for the newest features or new business model adaptations. The following diagram serves to explain the situation in simple terms. It describes a company that doesn’t make its money with technology, such as adidas, where it makes sense to outsource this part of the business to Demandware. The situation is very different at Zalando or AboutYou. Such companies could never use a standard SaaS solution or standard software (Hybris, Magento…), because they have to own the technology to rise up above the competition. This is exactly what Robert Gentz (Zalando founder) meant in his Kassenzone.de interview, when he said that nowadays the Zalando retail business is just one user of the Zalando technology platform. And this is exactly where many companies run into problems. They are very hesitant to invest and hope that standard software will be their all-in-one Swiss army knife, but still expect all of the possibilities of a pure-play company. That just simply does not work. Whoever intends to achieve the level of a pure-play company has to use their technical strategies and systematically play to these rules, form corresponding teams, remain very nimble and be courageous. Interestingly, companies which do not have a long-standing online history now find themselves, yet again, in some kind of technical and organizational “endgame fallacy”. They wish to make their (often severely outdated) technical systems fit for the future, build new MVP mode business models and naturally become, inter alia, technically sustainable and proceed as cost-effectively as possible in the process. The responsibility for all of this should lie with a CIO or a “Digital Unit” which should also still be able to transform the company structures at the same time. The endgame fallacy at its best! Companies which are able to resolve such conflicting goals have got have a good chance of getting a jump start in the right technical direction and of achieving success — and whether that’s with an in-house developer team or not doesn’t matter. The change that the “Professional segment” has undergone, driven by Shopware and Magento, among others, has now also appeared in the Enterprise segment. And that’s great for us! The assessments reflect my view of things and I’m looking forward to an engaging discussion on the subject.